The unpredictable weather of late is making getting out and about with a baby tricky. The days might be (mostly) warm but then night comes in cool. So how to leave the house without a suitcase of clothing and blanket options? Invest in the Papoose. That’s how. New York-based 7 A.M Enfant has just launched its Papoose in a simple lightweight design especially for spring/summer. I suspect you will still be using it well into autumn and until the cold really sets in. 7 A.M Enfant has thought of everything with the design of the Papoose. It has a water-repellent shell for starters, the filling is lighter for comfort in warmer weather and the lining is made from an anti-pill micro-fleece to keep it looking newer for longer. A full length zipper is perfect for easing a sleeping child in and out and there are openings to fit a five-point harness. Other clever design bits are a dummy holder and handy zipped front pocket. It can even be unzipped and opened to use as a stroller liner. 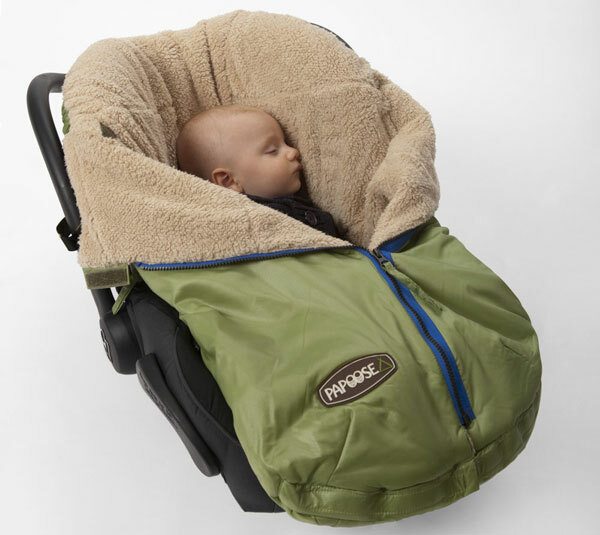 The Papoose comes in two sizes, small/medium for babies up to eighteen months, and medium/large for toddler up to three years. It has all the comfort of a pint-sized sleeping bag and you can choose from five awesome colours. I find myself quite partial to the fuschia with orange zips – who can resist such a combination! Priced from US$78, the Papoose is available from All Modern, with international shipping to Australia upon request.